The perfect retreat for one or two people . . .
these places are sanctuaries for rest and renewal. 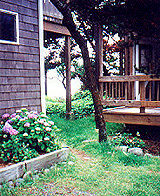 If you're looking for a Manzanita vacation rental on the north Oregon Coast, this beachfront lodging is a dream come true. Our ocean view beachfront accommodations in Manzanita offer Pacific Ocean and Neahkahnie Mountain views and are within walking distance of downtown Manzanita (art galleries, boutique shops, day spas, fine dining - including seafood) and the Manzanita Golf Course. A short drive takes you to Oswald West State Park (a popular surfing site), Nehalem Bay State Park, Nehalem River and Nehalem Bay (for excellent fishing - charters available - and kayaking), the Tillamook Cheese Factory and other Tillamook County activities and attractions. Click here to check availability of your dates and make your reservation. The LightHouse can accommodate up to six people. The Studio can accommodate up to three. Check-in time is 3 PM and Check-out time is before Noon. Sheets, pillowcases, towels and soaps provided. This is a departure from past requirements. The LightHouse has two queen size beds. The Studio platform bed is full-size, the window seat is a twin. Please turn down the heat and unplug any counter-top appliances when you leave, and leave the little places as clean as you found them. There is no smoking inside The Studio or The LightHouse. We are happy to accommodate your dog for an additional $10 per pet/night. We assume you will be responsible for any damages and for the conduct of your pet in the community of Manzanita and on the beach. We know that you will join us in respecting our friends, the full-time residents of Manzanita. The Studio and The LightHouse are located so that you can walk to town for shopping and fine dining.